STANDISH—The Scots played host to a bevy of other schools on Saturday morning, Feb. 2: Bonny Eagle faced off with teams from Windham/G-NG, Marshwood and Portland/South Portland, picking up some key wins despite being very young. At 126, Windham/G-NG’s DJ Pelletier logged a trio of takedowns and a couple of near-falls against Bonny Eagler Chris Rankin for a win. At 138, Dustin Brewer (BE) triumphed over Elisha Thompson by piling up a pair of takedowns and a pair of near-falls. 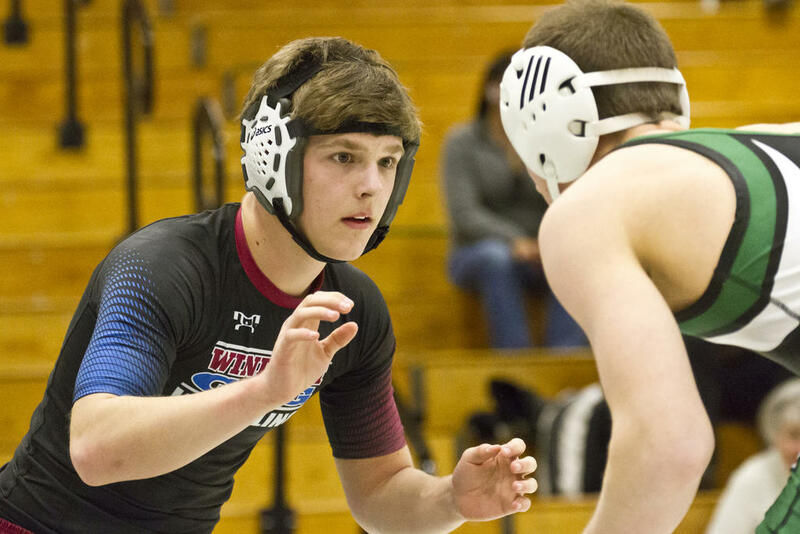 At 145, Peter Peterson (Windham/G-NG) bested Martin Worthington on a pair of escapes and a pair of takedowns, while at 152 Owen McDuffie (Windham/G-NG) topped Martin Doucette on four takedowns and an escape. Elsewhere, Morrison Doucette (BE) pinned Kyle Walker at 160 and Andrew Thomas (BE) pinned Andrew Martin at 172. Finally, Tristan Day (who wrestles with BE, but hails from Sacopee Valley) pinned Garrett Allen. At 120, Colby Frost (BE) won by pin vs. Sean Moriarty after racking up several takedowns and near-falls. At 126, though, Carson Goodwin (Marshwood) overpowered Rankin for a pin. Similarly, Hawks Liam Coomey, Brandon Sandler and David Spinney pinned Brewer, Worthington and Martin Doucette at 138, 145, and 152 respectively. At 160, Morrison Doucette pinned Jaime Alvarez del Manzano, while at 285, Zach Mercier (Marshwood) pinned Jake Harriman. Scot Caden Frost strung together several takedowns, near-falls and escapes vs. Ali Abdelhassan before defeating him by pin at 106; Hussin Al-Saadi (Portland/South Portland) got the better of Brewer at 138, however, winning by pin as well. 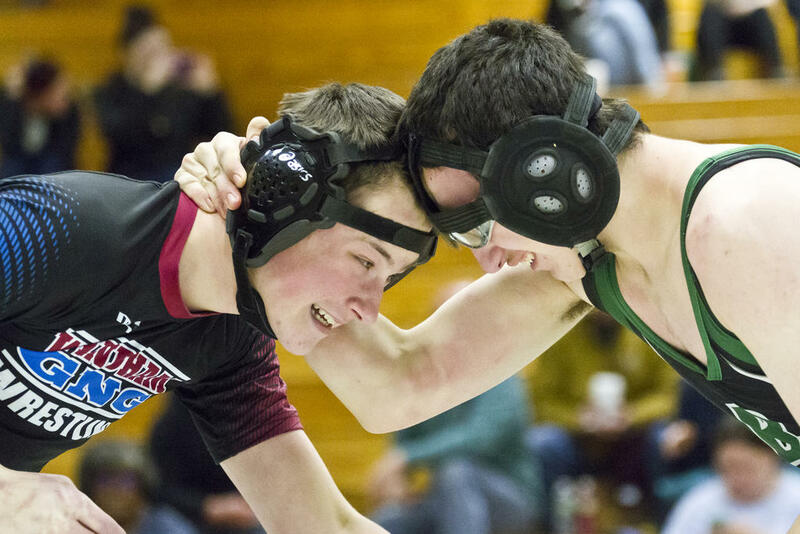 Through the middle weight classes, Worthington bested Charlie Salow on a pair of takedowns and a reversal, Martin Doucette pinned Abdullah Abdullah, Zach Elowitch (Portland/South Portland) pinned Morrison Doucette and Thomas pinned Jack Cole. At 220, Day pinned Darrian Darling and at 285, Harriman pinned Harry Degenhardt. Marshwood’s Goodwin outscored Pelletier at 126, While Coomey pinned Peterson and McDuffie pinned Sandler. Spinney bested Walker by tech fall, Andrew Martin pinned Alvarez del Manzano, and Dylan Strong (Marshwood) defeated Trent Overcash – another pin. At 138, Al-Saadi pinned Peterson, while at 145, McDuffied pinned Salow. Abdullah won over Walker by decision. Elowitch pinned Gabe Gendreau, Andrew Martin pinned Cole and Randy Stone (Portland/South Portland) pinned Overcash. Finally, Darling bested Allen by major decision. For a longer version of this article and additional photos, visit www.keepmecurrent.com/category/sports. Eli Thompson circles his Bonny Eagle opponent. Dustin Brewer circles his Windham/G-NG opponent. Kyle Walker battles at 160 for Windham/G-NG. Chris Rankin clashes with his Windham/G-NG opponent. Windham/G-NG’s Andrew Martin goes head-to-head with his BE opponent. Windham/G-NG’s Peter Petersen sqaures off with Bonny Eagler Martin Worthington. Bonny Eagle’s Andrew Thomas gets leverage over his Windham/G-NG opponent. Bonny Eagle’s Jake Harriman battles his Marshwood opponent. Colby Frost contends with his Marshwood opponent.